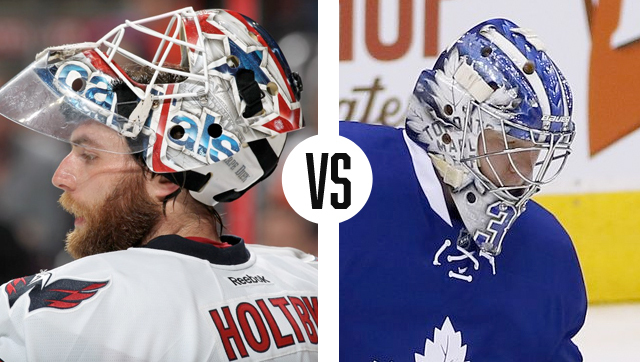 March Madness may be over, but now we have a new bracket to fill out, because for the third year running, the playoff battle royale of goalie masks has returned. Both of last year’s finalists are back in the mix again, so will we see a repeat champion or will a new winner be crowned? Like in past seasons, we’ll be pitting the starting goaltenders’ masks up against each other in matters of branding, composition, and overall aesthetic value. 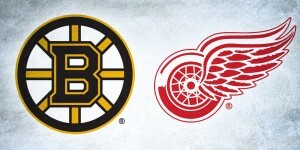 To get things started, let’s take a look at the first round match ups and see which bucket in each series will advance to the next round. In our first Daveart-versus-Daveart matchup of 2017, we have two very similar buckets facing off in the first round, not surprising given that they come from the same artist. 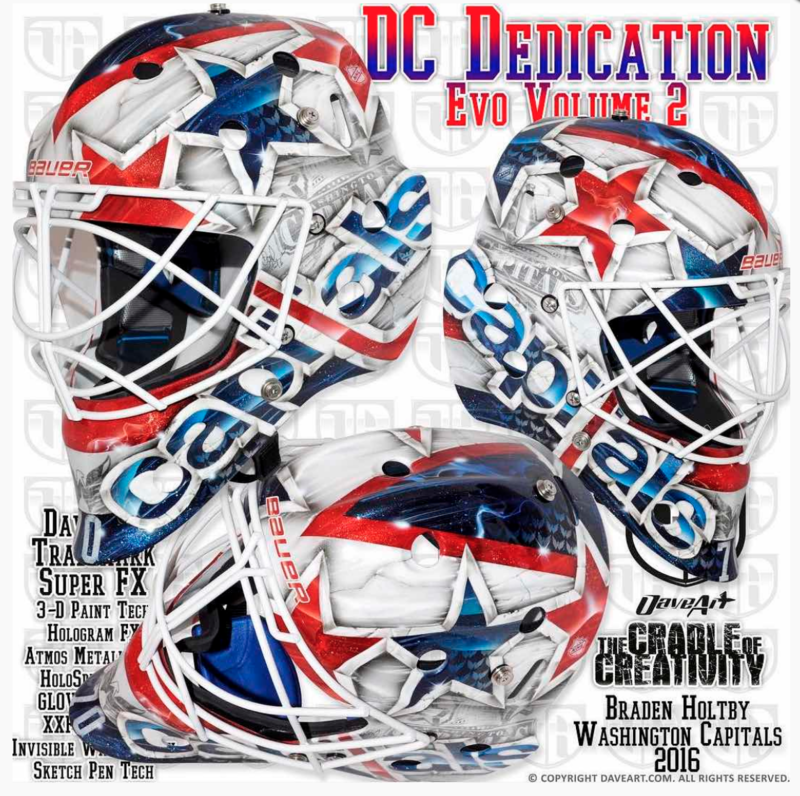 Caps netminder Braden Holtby has had a number of patriotic masks created by Dave Gunnarsson over the years, and the latest iteration doesn’t stray too far from tradition. “It is such a joy to create a mask story from mask to mask and evolve it through the years,” Gunnarsson shared of the design. 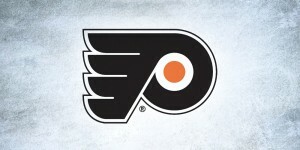 “This new design goes in the well known Holtby style, and here [we] created in a subtle vintage style.” The mask is loaded with special effects layered into a bold Capitals-centric design, but the overall composition ends up looking a tad cluttered and distracts from all of the intricate detail. For the first time in his young career, Andersen’s mask is free of any Legos or comic book characters, somewhat of a signature we’ve come to know the netminder for. Instead, the design focuses fully on the Leafs’ new logo with white renderings on each side and a pattern down the middle created from the tops of the leaves. 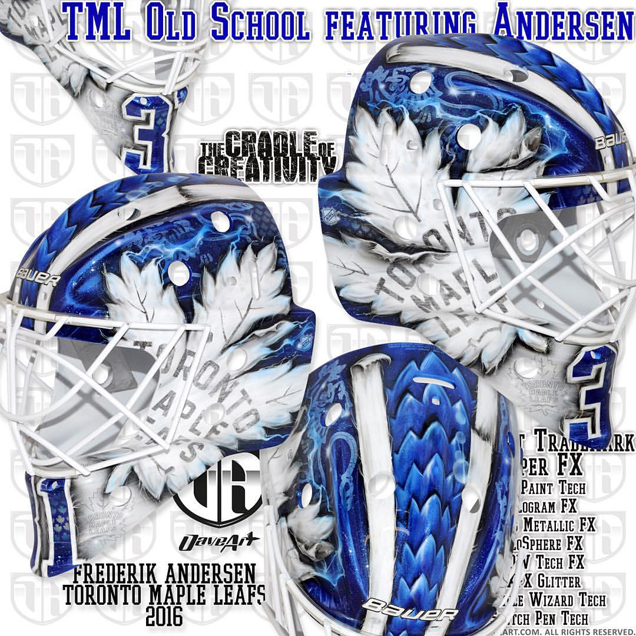 Andersen’s number 31 on the chin is filled with tiny maple leaves in a holographic pattern. 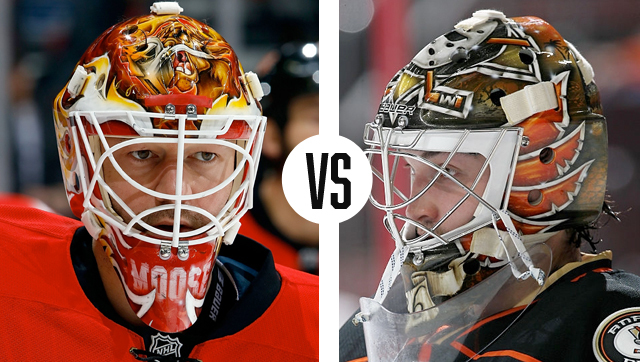 While these masks are very similar in style, the larger design elements on Andersen’s create for a more balanced composition and ultimately earn Freddie a victory in round one. 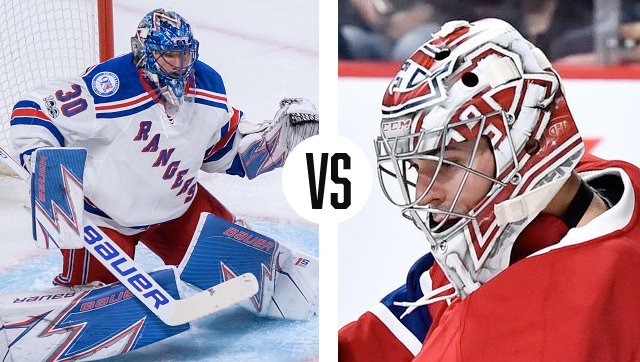 In yet another Daveart-versus-Daveart matchup, the Rangers and King Henrik take on the Habs and Carey Price in a battle of red, white and blue buckets. While both were painted by the same artist, these masks have wildly different aesthetics, so let’s start with Hank. 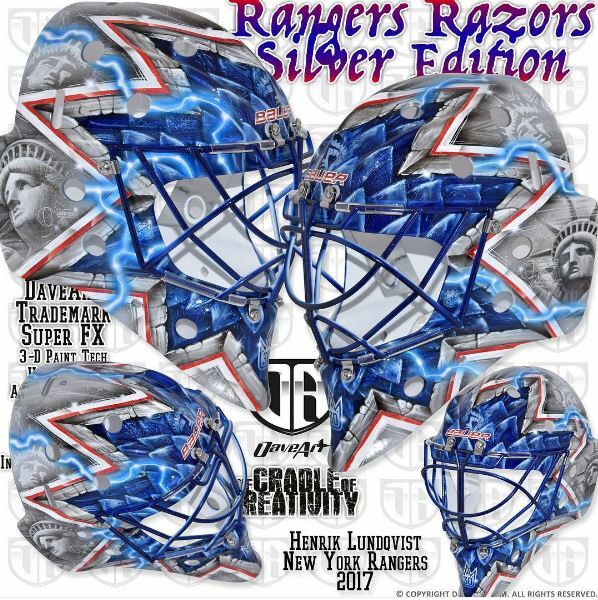 His second playoff mask, which Hank debuted in game one Wednesday night, also uses the standard razor crown / Lady Liberty motif but with more of a starbust-effect around the face and realistic Lady Liberty imagery surrounding it. In true Daveart fashion, lightning strikes and special effects fill the design to add color and dimension to an otherwise simple composition. Price’s mask has a much more traditional aesthetic, centered completely around the iconic Canadiens logo. 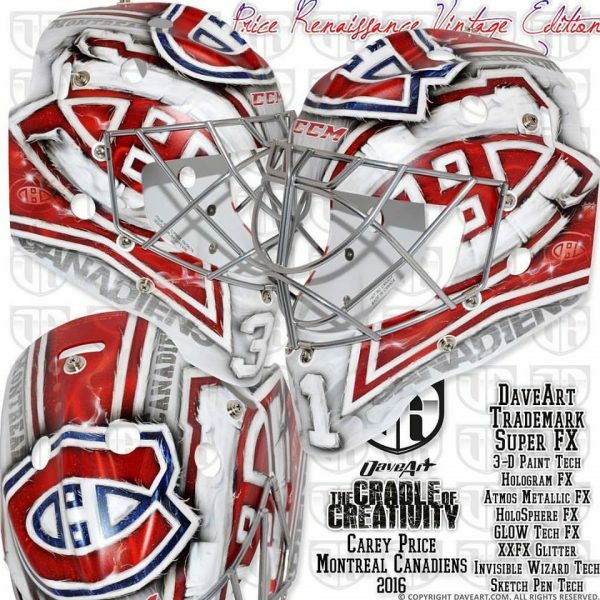 “Carey’s latest mask design is a direct continuation of his latest Habs masks,” Gunnarsson shared. “A design inspired from Canadian hockey and the nature of Canada.” With a matte finish, symmetrical composition and minimal color palette, this design lets the timelessness of the logo shine through. While Price’s mask is certainly a thoughtful and well-executed piece, the depth and detail in Lundqvist’s latest takes round one. In our third series, we have not one but two masks painted by artists not named Dave Gunnarsson. 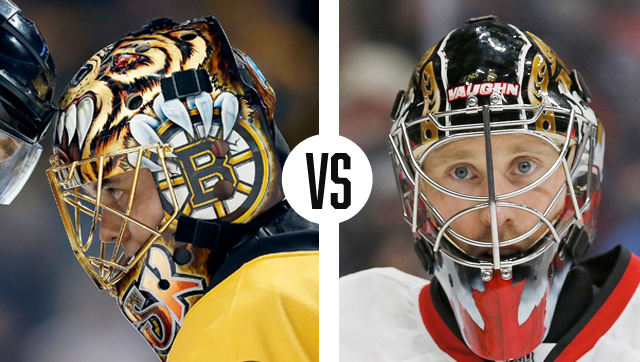 Making his first Bucket Bracket Showdown appearance, Tuukka Rask’s Ron Slater mask faces off against Craig Anderson and his Sylabrush bucket. 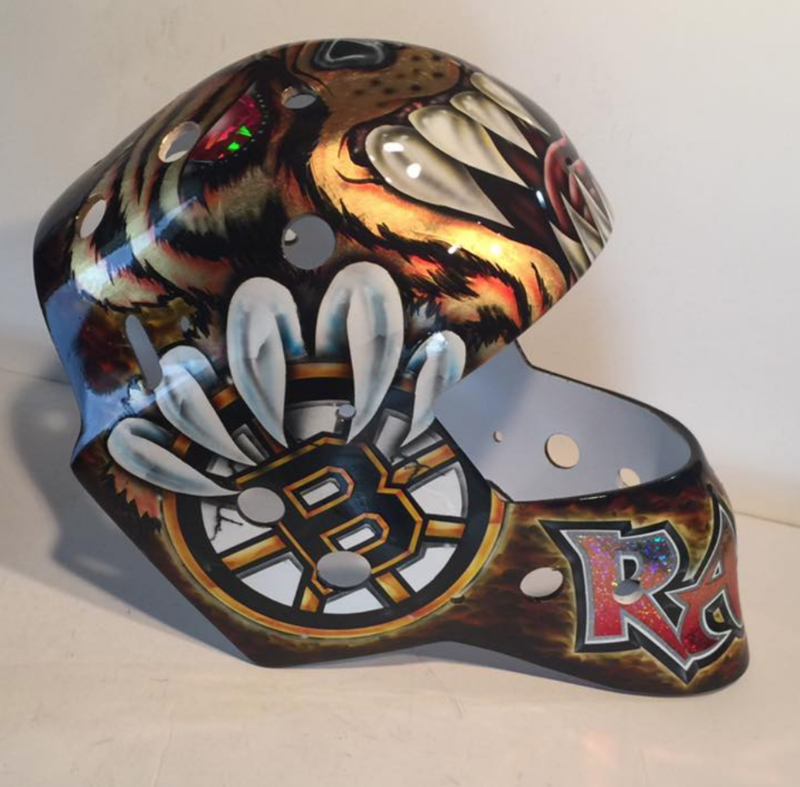 The Bruins’ netminder hasn’t changed much about his mask over the years, as says Slater, “part of me wants to do something different for him, but I think he’s kind of superstitious about stuff and doesn’t want a change either.” Instead, Rask has essentially stuck with the original design created by Slater when he first arrived in Boston, with a bear on top, gold chrome cage and gold foil lettering across the chin. On the other side of the ice, Anderson’s mask has a little bit of magic built in thanks to Sylvie Marsolais and her ghost paint technique. As Marsolais told us in her interview, “the Ghost paint needs hot temperature to be revealed, [so] it’s not very useful on the ice, but we can hide stuff that the goalie wants on his mask but doesn’t want to be seen by everyone.” The simple and symmetrical design mask features a maple leaf on the chin with the Senators logo and a Corvette on each side. While Anderson’s bucket has some nice personal touches and is executed flawlessly, the chrome details and dimension on Rask’s helps the Bruins advance to the next round. 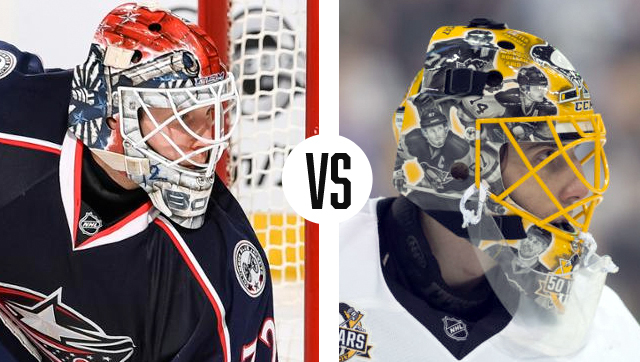 Last year’s Stanley Cup champs take on the Blue Jackets in the first round, pitting Sergei Bobrovsky up against veteran Marc-Andre Fleury due to an injury to Matt Murray in game one, last year’s mask runner up. 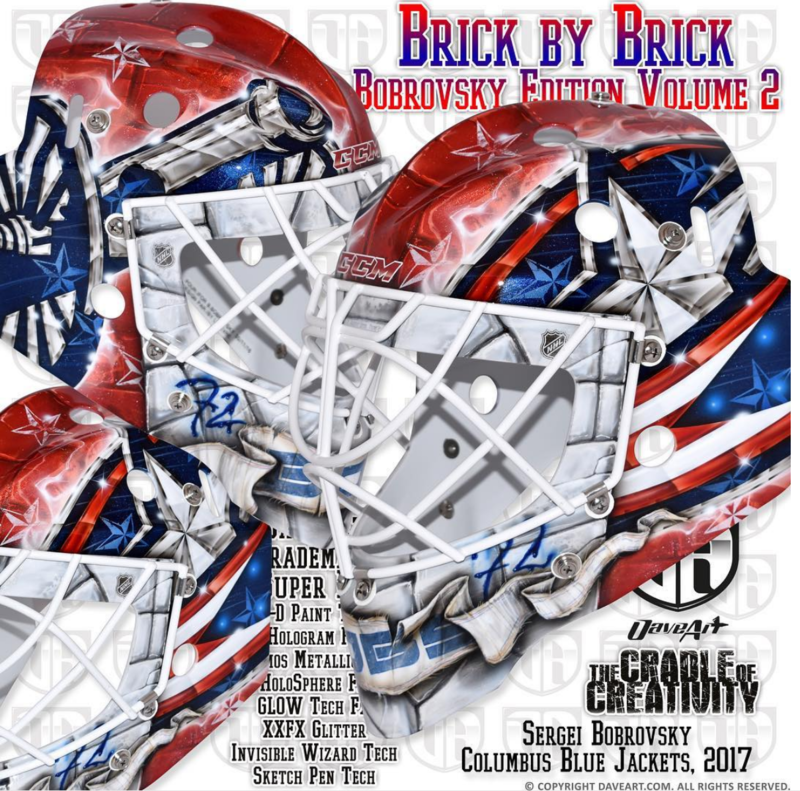 Painted by Dave Gunnarsson, Bob’s mask is all Columbus, incorporating a flurry of stars with the Blue Jackets’ cannon and primary logo on the sides. 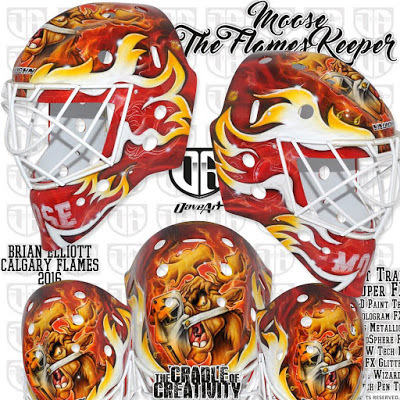 Titled “brick by brick” by the artist, this mask has a stone motif underneath the cage, an element we’ve seen time and time again from goalies over the years, with a graffiti 72 and a banner with Bob’s name across the chin. The sides of the yellow bucket are covered with black and gray portraits and the names of Penguins past and present, including Crosby, Kunitz, Lemieux, Malkin, Jordan Staal, Letang, Talbot and Pascal Dupuis. Down the middle are the Penguins’ primary logo (also in Pittsburgh yellow) as well as the 50th anniversary logo on the chin. 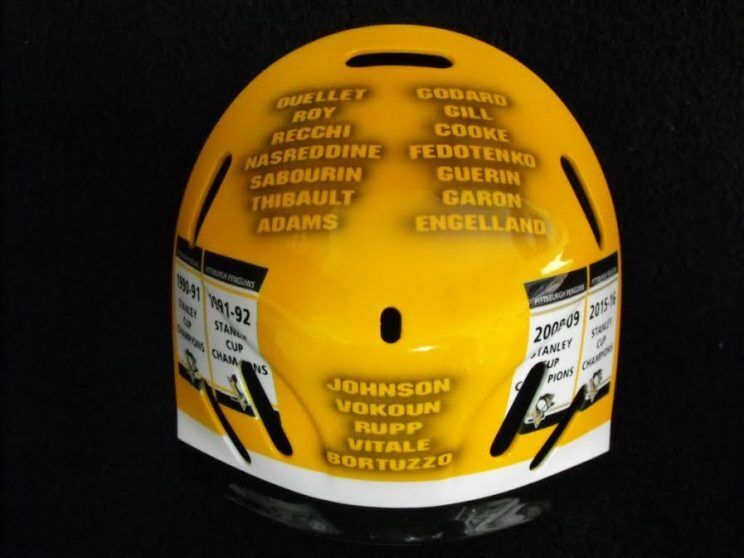 The back plate includes more names of players Fleury holds in high regard, like Bill Guerin, Mark Recchi and Craig Adams. The simple color palette and beautifully executed portraits make this mask a really lovely piece, both in sentiment and in design. 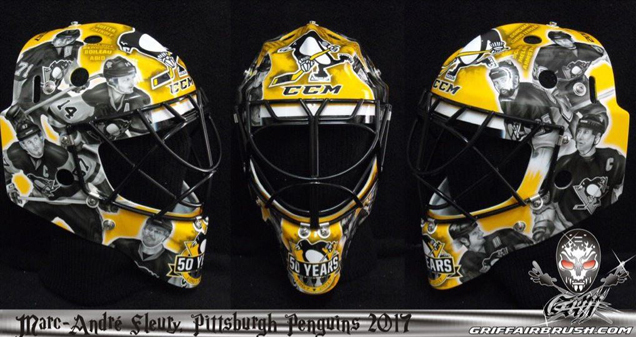 While Bob’s bucket may have the bolder branding in its favor, the concept and artistry in Fleury’s makes it the hands-down winner of this round. 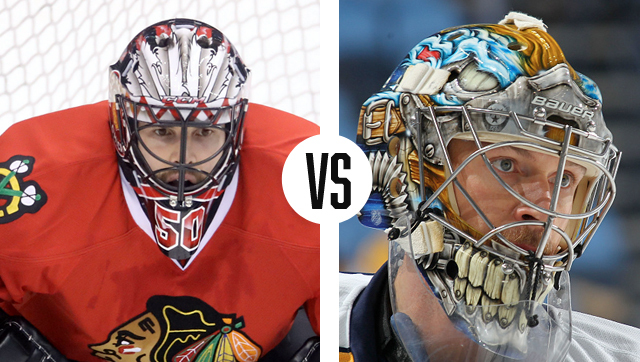 For our first western conference matchup, Crawford and Rinne bring two completely different styles to the table in their masks. 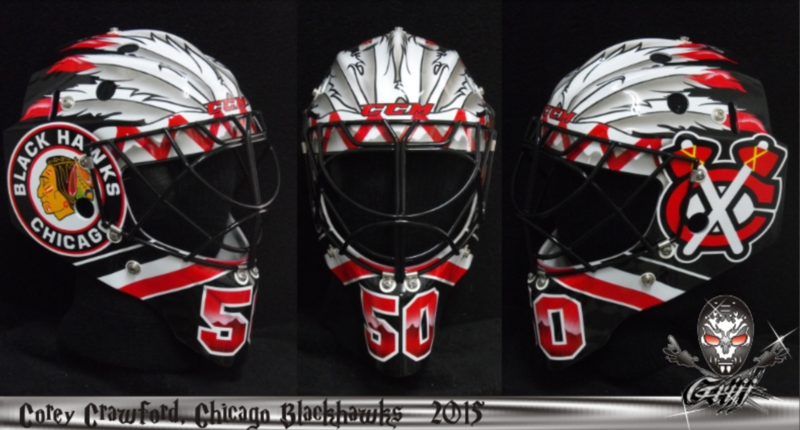 Painted by Stephane Bergeron, the Blackhawks netminder has stuck with his design from the previous season, a minimal red, white and black design with feathers across the top and a large 50 on the chin. 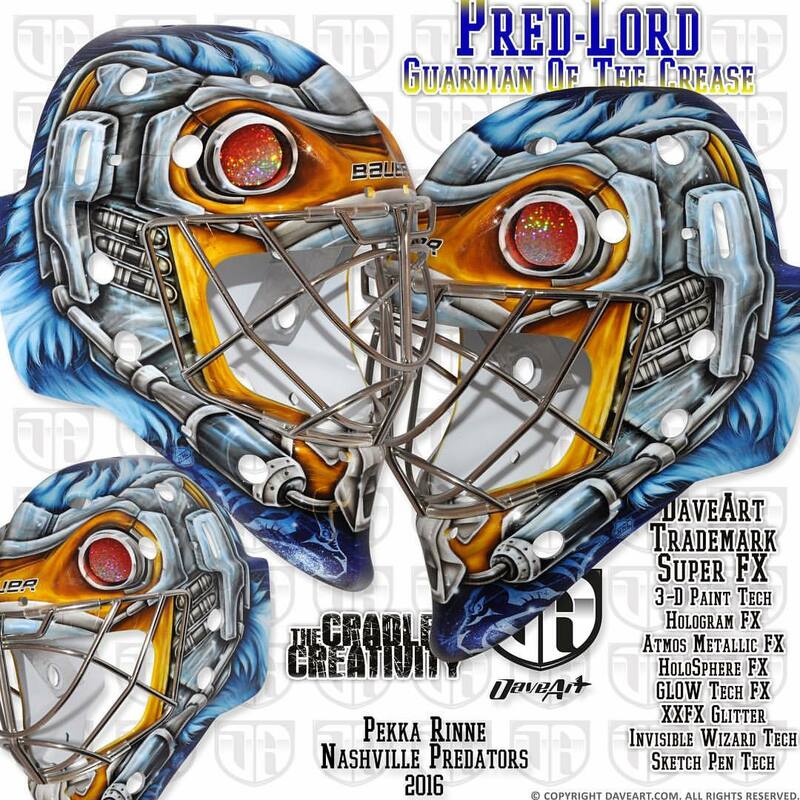 Rinne’s mask on the other hand has nothing minimal about it. The design is full of crazy special effects, a smorgasbord of colors and a variety of textures. Like with all Daveart designs, the workmanship and attention to detail is never lacking, however this look is just overwhelming to look at, particularly from a distance. 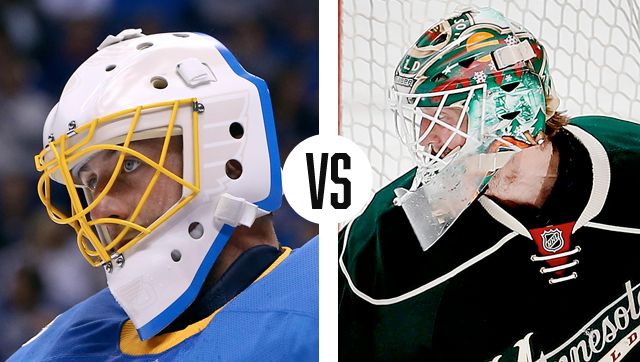 Another matchup with drastically different looks is the showdown between Blues netminder Jake Allen and Wild goalie Devan Dubnyk. 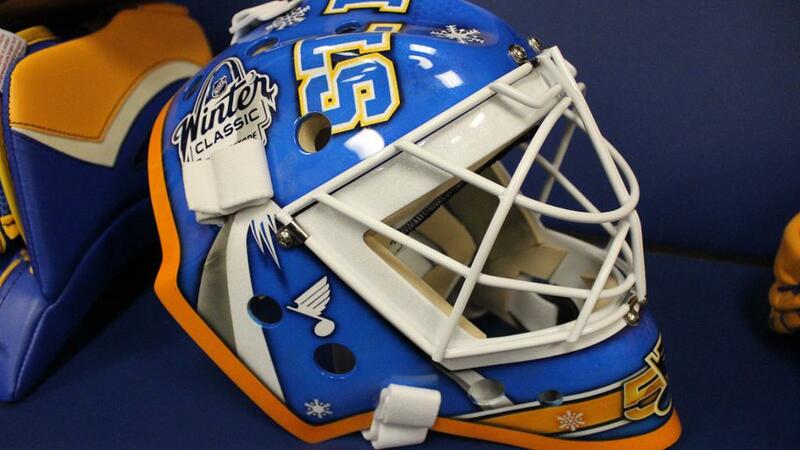 All painted by Jason Livery, Allen has had a number of fantastic retro mask designs this season, including his Winter Classic bucket for the game at Busch Stadium. In February, Allen debuted an unusual all-white look with blue trim, and a bold yellow cage. 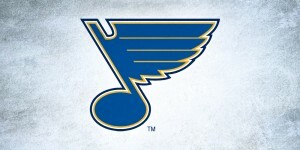 The Blues’ logos are subtly ghosted in off-white paint, leaving the design with a flat, graphic look at first glance that coordinates perfectly with the Blues’ throwback sweaters and the goaltender’s retro pad setup. 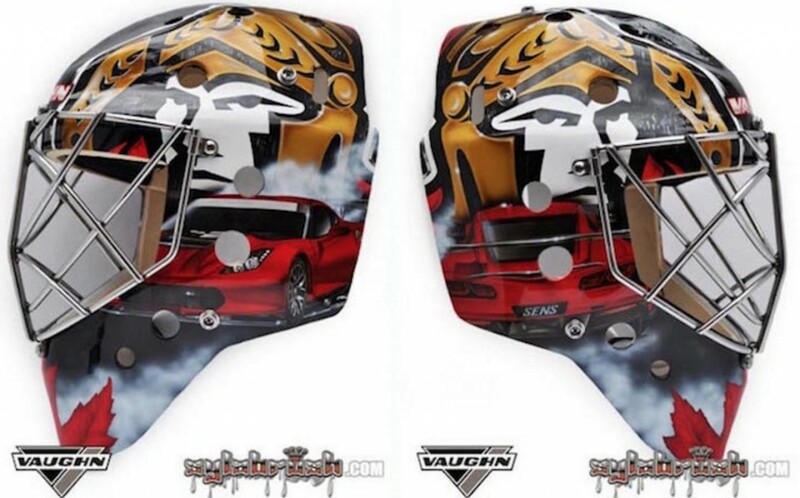 Dubnyk’s mask is anything but flat, including layered Wild logos, snowflakes, trees and his signature cartoon giraffe. While this mask is quintessentially Dubnyk, the busy design is ultimately distracting and loses out to the simple elegance of Allen’s retro flair. 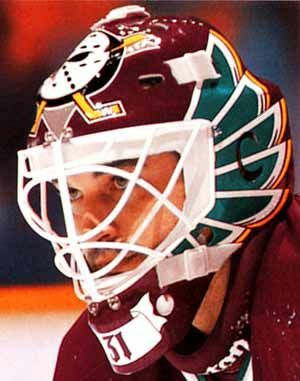 Gibson’s mask, also painted by Gunnarsson, takes a similar approach in pulling inspiration from past designs but adding a modern twist. 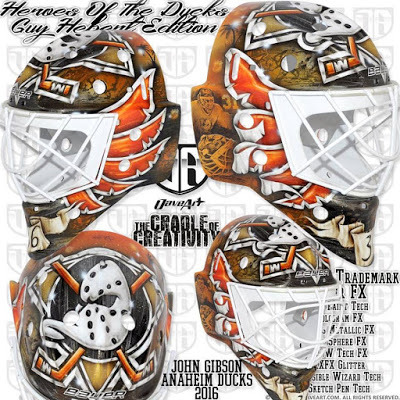 “John wanted to pay tribute to legendary Ducks players from the history of the franchise,” Gunnarsson shared, “and what could be better than start with the first Ducks goalie, Guy Hebert.” Gunnarsson kept the wings and Mighty Ducks logo from the original Hebert mask, painted by Dennis Simone, but added a portrait of Hebert in the background and his trademark special effects to bring the design into modern day. Both these masks are fairly busy in their composition, but the historic references in Gibson’s gives the Ducks the push to take the series. 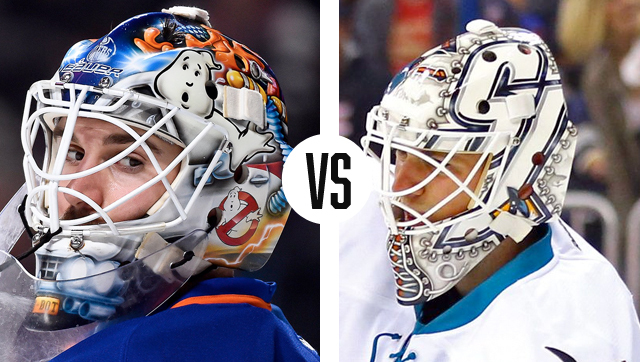 Last year’s champion, Martin Jones, takes on Cam Talbot and the Ghostbusters Oilers in the first round of the 2017 showdown. 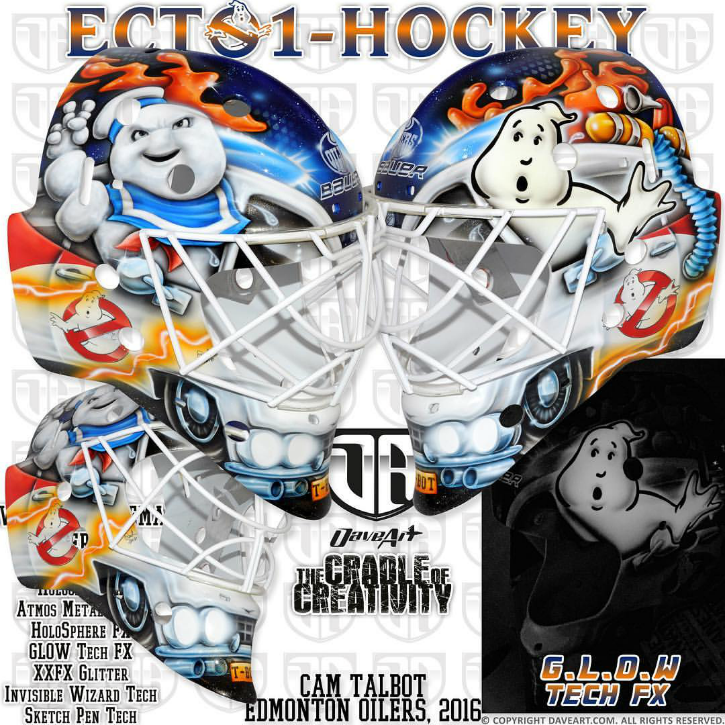 From his time with the Rangers to now in Edmonton, Talbot and Dave Gunnarsson have been cooking up Ghostbusters-inspired masks for many years. As the artist described of this iteration, “it is transformed into a certain car… the one and only, the ECTO-1 Car! If you are a ghost…watch out…!” Setting this apart from past Ghostbusters-themed buckets, Gunnarsson interpreted the entire mask as the car is an innovative and fun way of approaching the design. 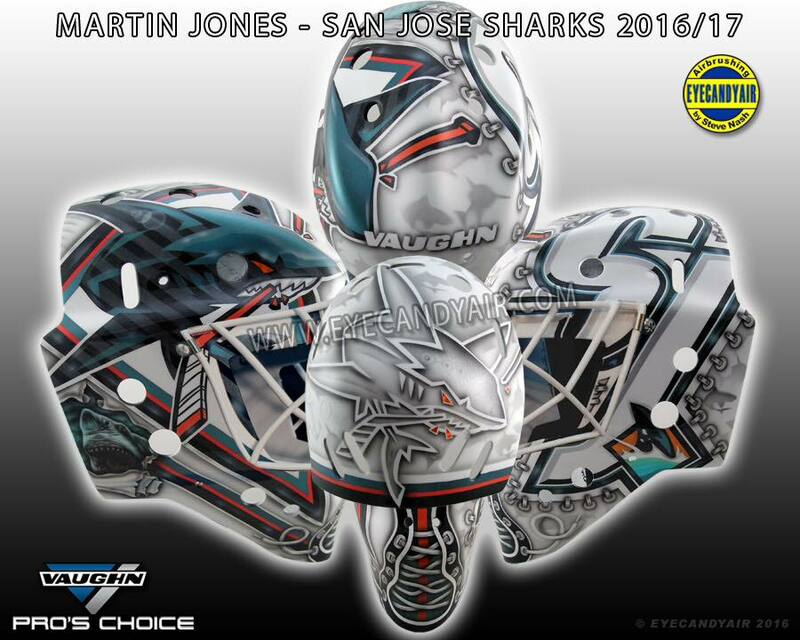 On the other end, Martin Jones’ mask painted by Steve Nash is 100% focused on the San Jose brand and not much of an aberration from the bucket that won him our 2016 crown. 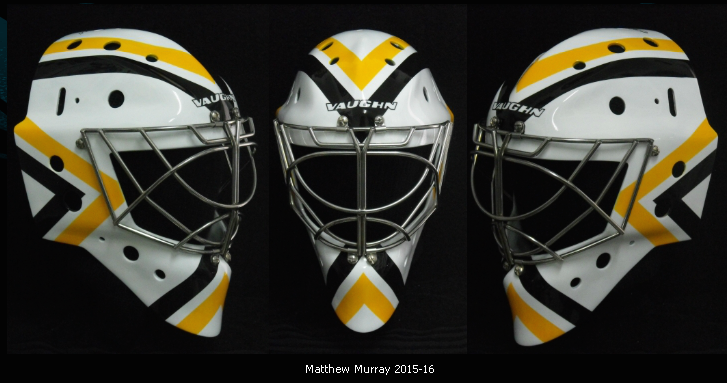 The front of the mask laces up, mirrored with grommet-like stitching around the alternate logo on the left side. The minimal background, both in color and in design, allow the colors and logos to really shine along with Nash’s amazing technical execution. Talbot’s mask gets brownie points for the innovation factor, but Jones’ mask is the full package in brand, composition and execution, making it impossible for the Oilers netminder to conquer.